Kush have a knack of making forward-looking products that exude vintage vibe — and this remarkable compressor is no exception. 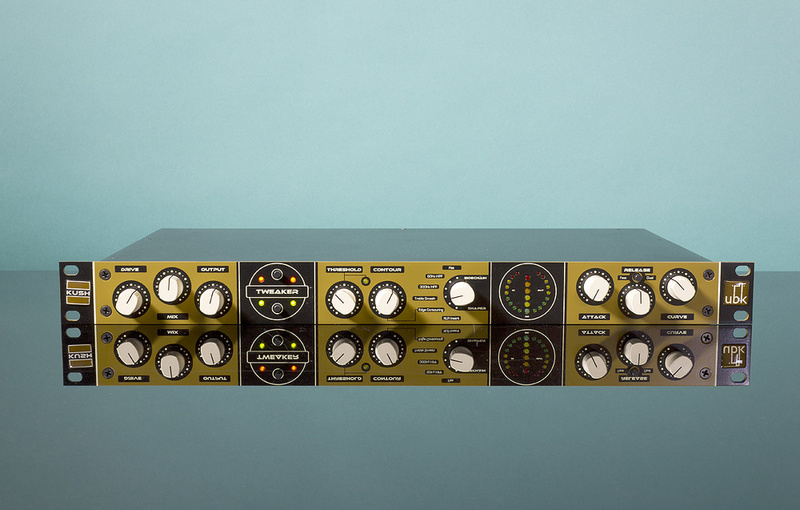 The MI market is awash with replicas to and homages of classic analogue outboard audio processors, especially those from the ‘60s and ‘70s, both in hardware and in plug-in forms. Reincarnating these devices from decades past has its merits, of course, not least in allowing easy and affordable access to characterful sound processing when the original hardware might be financially out of reach or technically unreliable. However, this approach doesn’t move the industry or the art forward, and it doesn’t bring new creative possibilities — ironically these are the very things for which those original processors were all designed and employed! In contrast, Gregory Scott’s ‘House of Kush’ products are interestingly innovative and positively encourage user creativity, which I think is to be commended. The company’s new UBK Tweaker compressor demonstrates this particularly well, expanding intelligently on the familiar ideas and technologies of ‘standard’ compressors to deliver a tool which can, almost literally, do anything and everything; it allows the creation of new dynamic control characteristics as well as replicating old-school devices quite convincingly. 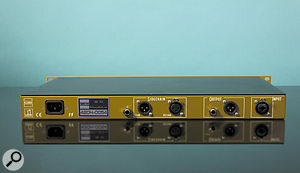 The Tweaker is a single-channel, 1U rackmount device, extending about 255mm behind the rack ears. The rear panel carries an IEC mains inlet accepting any AC voltage between 110 and 260 Volts, and audio connectivity comprises an electronically balanced input and output, both on XLRs, plus an additional quarter-inch TRS output socket (both can be used simultaneously). Two more XLRs provide a balanced send-return insert point for external side-chain processing, and although the Send outputs the (processed) side-chain signal at all times, the return only becomes active when selected on the front-panel ‘Sidechain Shaper’ rotary switch. A second quarter-inch TRS socket enables side-chain linking so that two Tweakers may be used on stereo material with shared control voltages to ensure stable stereo imaging. The heart of the Tweaker is its dynamic attenuation element, which is described as a ‘vintage, discrete VCA’, and appears to be built around a pair of LM394 ‘supermatch pair’ transistors. Reading between the lines, I presume this circuitry is configured along the lines of the famous ‘Blackmer Gain Cell’, a pioneering transistorised VCA circuit developed in 1970 by David Blackmer (the man who also co-founded the Dbx company). Internally, the Tweaker is built to high standards, with conventional components laid out spaciously on a large circuit board that covers the unit’s entire floor area. A second, smaller board sits behind the front-panel controls and is linked to the main board via five short ribbon cables. There’s nothing particularly exotic in the active componentry, with mostly RC4558, LM301 and (one) TL072 op-amps in evidence. The cleverness of the Tweaker’s design really lies in its innovative and unusually configurable side-chain section — the ‘Sidechain Shaping’ moniker describes its raison-d’être rather well. Not surprisingly, the controls are not entirely familiar or intuitive, but thankfully the handbook explains things very well and in considerable detail, and some hands-on familiarity quickly reveals how things work in practice too. The front-panel controls comprise eight 21-detent pots, a six-position rotary switch and three push-buttons. 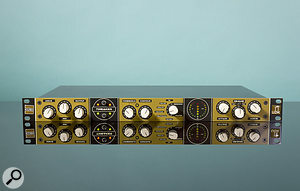 The detented action on the rotary controls allows reasonably accurate replication of control settings, which is helpful when trying to dial in the various ‘analog preset’ examples provided by Kush to emulate the characteristics of many classic compressors like API’s 2500, Valley People’s Dynamite, Universal Audio’s LA-2A, and several others. The disparate nature of the compressors modelled in these presets illustrates well the considerable versatility of the Tweaker’s design. The first three rotary controls, labelled Drive, Output and Mix, may all seem quite conventional but there are some interesting nuances. Firstly, the Drive control alters the signal level being fed through the VCA, with higher levels generating more distortion (a pleasant, musical-sounding distortion). Minimum Drive ensures plenty of headroom in the VCA and thus negligible distortion for an ultra-clean character, while the reverse leads to considerable distortion for a crunchy ‘70s-style sound. So far, so logical, but a very clever side-effect of using the VCA to provide musical distortion — rather than overdriven input or output buffers as other devices do — is that the level of distortion is inherently reduced when gain reduction is being applied (because the gain of the VCA circuit is lowered). The practical upshot is that loud initial transients are naturally cleaner-sounding than sustained loud sounds, which is very beneficial in helping transients to cut through without sounding nasty. Essentially, the ‘grunge’ is applied where it’s wanted, and not where it isn’t, which is a subtle but highly advantageous bonus. Secondly, the Output level control doesn’t affect the output volume directly; it only controls the signal level leaving the VCA and going into the (wet/dry) Mix control. If the Mix control is set ‘fully wet’, the Output level does genuinely control the Tweaker’s overall output level, but if the Mix control is used to bleed some direct signal into the mix, the overall output level depends on the precise combination of the current input level, the position of the mix control, and the Output setting. This might seem confusing, but in practice it’s much easier and intuitive to use than it sounds, and this arrangement provides considerable flexibility for fine-tuning the balance in parallel compression configurations. The Tweaker also caters for external processing of the side-chain signal.Associated with these I/O controls, albeit mounted over on the right-hand side of the front panel, is a rather unconventional ‘Tri-meter’, a circular display of three LED meters which indicate the input, output, and gain-reduction levels, all at the same time. The circumferential input and output meters both employ nine small LEDs in conventional green-yellow-red bar-graphs, and, although there are no scale markings, the first yellow LED illuminates around 0dBu and the first red at about +8dBu. The handbook confusingly suggests the second yellow LED corresponds to -16dBFS — such an alignment, of course, depends entirely on an external A-D converter’s calibration and it’s a complete nonsense to quote digital levels in an all-analogue product! The unit clips at around +22dBu and distortion builds steadily above +8dBu. With no gain reduction applied and minimum Drive, the distortion is around 0.01 percent with the output at 0dBu, rising to 0.5 percent distortion at +12dbu, and 1.5 percent at +19dBu. The display’s central, vertical gain-reduction meter works with a ‘dot mode’ display (rather than a bar-graph) using six larger LEDs. 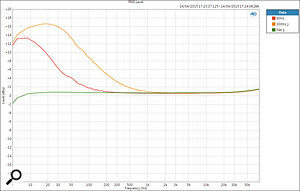 Again, there’s no decibel scale, but the first green LED illuminates when the gain reduction (GR)reaches about 2.5dB. The subsequent LEDs light up when the GR reaches approximately 5dB, 8dB, 10dB, 15dB and 20dB. Initially, I found this Tri-meter configuration caused a bit of a visual overload, but it’s logical enough and I soon got used to it. Mirroring the Tri-meter’s circular layout on the left-hand side are two unmarked push-buttons (each with a pair of status LEDs), and it turns out that the top one powers the Tweaker on-off, while the bottom one applies a relay-switched bypass. 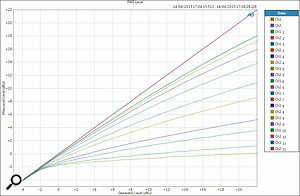 Compression Curves: a transfer plot illustrating the range of compression ratios on offer. The top purple line is with the unit bypassed (1:1 ratio), and the others were taken at alternate click stops on the Curve control. The lowest ratio is roughly 1.25:1 and the highest about 15:1.Attack and release time constants are set with a pair of detented rotary controls on the right-hand side, and the control ranges are far wider than most compressors. The attack time spans a frighteningly quick 20 microseconds up to 70 milliseconds, and the release time offers the same ultra-fast 20 s up to 500ms in its normal, linear-release, mode. An alternative ‘dual-release’ mode is also available via a black push-button. In this configuration, the first 50 percent of gain reduction is released very quickly and the remaining 50 percent far more gently — an arrangement which, for most compressors, is described as ‘auto-recovery’. The advantage of this dual-release system is that it retains the dynamic punch of a fast release while simultaneously avoiding any hint of pumping, the combination providing a very transparent compression effect. When switched to the dual-release mode, the gentler part of the recovery slope can be adjusted between 500ms and a positively leisurely 7.5 seconds. A third control in this section is marked ‘Curve’ and it alters the compression ratio, nominally starting with a gentle 2:1 at the counter-clockwise end, rising to a 30:1 limiting ratio when fully clockwise. 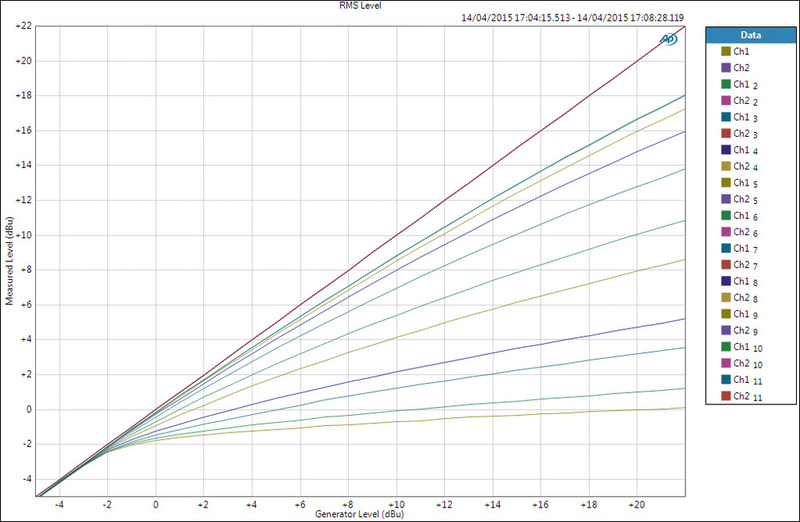 In fact, my bench tests suggested the minimum is closer to a very gentle 1.25:1 and the maximum ratio nearer 15:1. The transitional ‘knee’ as the compression is introduced becomes sharper with increasing ratios, too: starting off with a very slow and gentle knee for the most placid transition into compression, becoming sharper as the ratio increases to give a more pronounced entry into high-ratio compression/limiting. The most interesting side-chain-shaping controls are placed in the centre of the front panel, and initially lull you in with a very conventional threshold control — probably the most straightforward knob on the whole machine! Turning this control clockwise lowers the threshold to achieve more compression. Naturally, the threshold setting also interacts to some degree with the Drive control, but the inclusion of an ‘over-threshold’ LED makes it very easy to see precisely when the audio signal crosses above and below the set threshold, which helps enormously in effecting exactly the right parts of the audio signal. 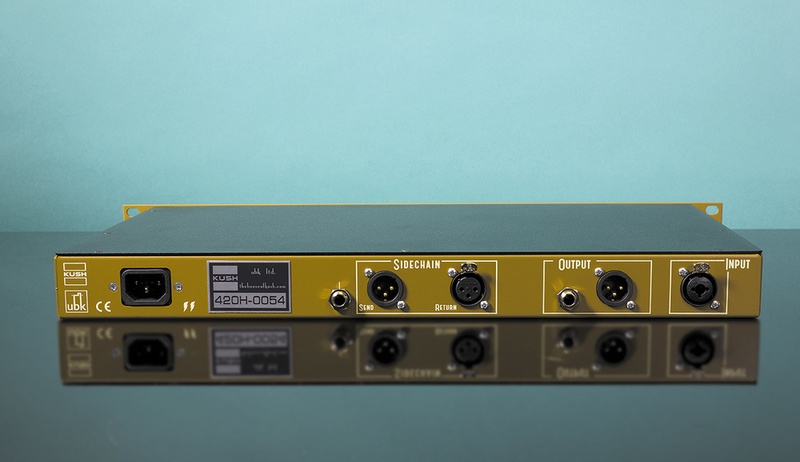 The unique ‘Sidechain Shaper’ rotary switch is the key to focussing the applied compression on the desired part of the audio spectrum. Of course, the Tweaker is a full-band compressor, and once gain reduction is applied it affects the entire spectrum, but if the Threshold control can be said to determine when the compressor acts, the side-chain-shaping controls determine the reason why. The first switch position provides an unprocessed side-chain like most standard compressors, while the next two modes employ high-pass filters in the side-chain-sensing circuitry with -3dB points at 60Hz or 300Hz. The former dissuades the compressor from acting on the very lowest frequencies, so it largely ignores the kick drum and other extreme low-end instrumentation. The 300Hz option desensitises the compressor to everything from the low-mids down, so that it reacts mainly to the upper mid-range energy and largely leaves the warmth and fullness character elements within the track alone. 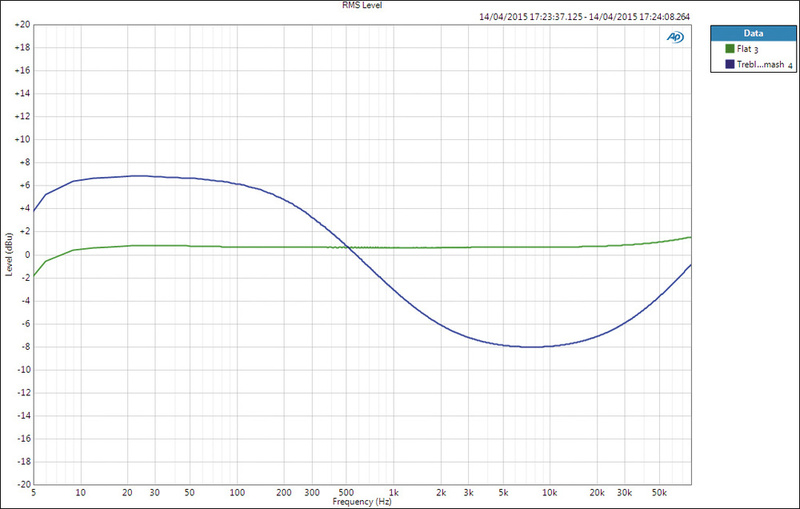 The next option, ‘Treble Smash’, applies both an LF cut (below 300Hz) and HF boost (peaking at about 8kHz). This EQ curve is apparently based on the company’s Clariphonic EQ (http://sosm.ag/sep11-kush-clariphonic), and is intended to make the compressor much more sensitive and reactive to transient detail, like the brashness of cymbals, the brittleness in high strings or acoustic guitars, or the harshness of some vocals. I found its effect was to simultaneously soften and thicken the high frequencies, especially fast transients, in a way that’s reminiscent of overdriven analogue tape or even heavy FM radio processing. It’s an unusual effect, but a very useful one. 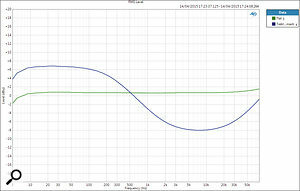 This frequency response plot illustrates the varying side-chain sensitivity using the Edge Contour control. 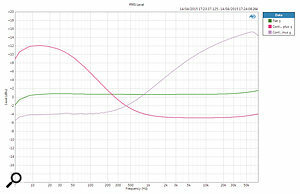 The dark-pink line shows how the compressor becomes more sensitive to the high end and less to the low frequencies with the control turned fully clockwise. The purple line is at the fully counter-clockwise position where the reverse occurs. The green line is the flat response from the control’s central position. 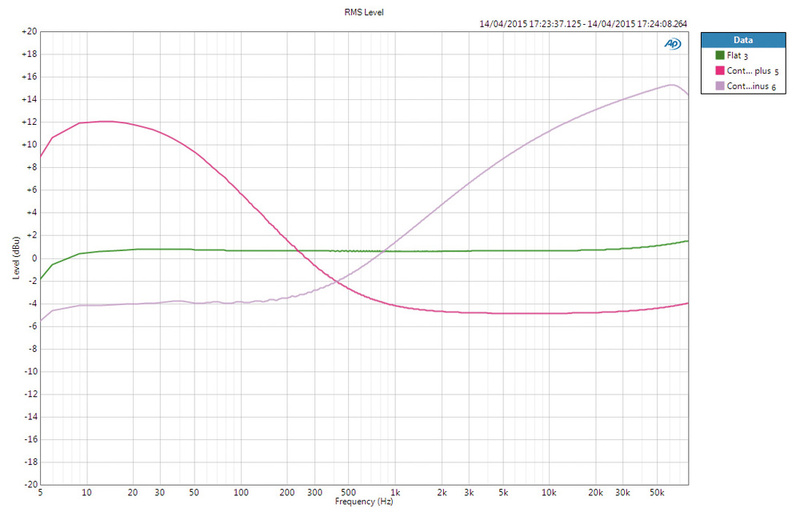 Next up is an adjustable ‘Edge Contour’ mode, which effectively employs a form of ‘tilt’ EQ in the side-chain. With the Contour control at the 12 o’clock position the side-chain response is completely flat, and works like any other generic compressor. However, turning the knob clockwise makes the Tweaker more responsive to the upper-mid and treble content while simultaneously reducing sensitivity to the low-mids and bass. When fully clockwise the side-chain’s frequency response is similar to the Treble-Smash option, except that the HF part of the curve is a shelf instead of a bell, and not quite as intense. Turning the Contour control counter-clockwise has the opposite effect, boosting the compressor’s sensitivity to the low-mids and bass while disregarding the upper-mids and HF. Although very simple in concept, this is a surprisingly effective way of focussing the compressor’s attention on the parts of the spectrum that need reigning in. The final option engages the insert return on the rear panel, allowing an external equaliser (or any other kind of processor) to shape the side-chain control signal, or to use an external audio (key) signal to control the amount of compression. As there’s no normalling between the two XLR sockets, selecting the external send-return loop with nothing connected disables the compressor’s side-chain completely. The Tweaker is a compressor that takes some time to master, but the journey is well worth it because this is an extraordinarily versatile processor. It can sound extremely transparent and clean, if required, having that kind of see-through finesse of an optical compressor, but it can also add serious attitude and dirt when called for, bounce along effortlessly, and modify percussive sounds in very unusual ways. Although I found the range of ratios to be lower, overall, than the manufacturer’s claims, I think this is to the Tweaker’s advantage, particularly if used for stereo mix-bus processing where a minimum of 2:1 is often too harsh. And at a maximum of 15:1 the Tweaker can still smash the dynamics with a powerful hard-limiting effect. 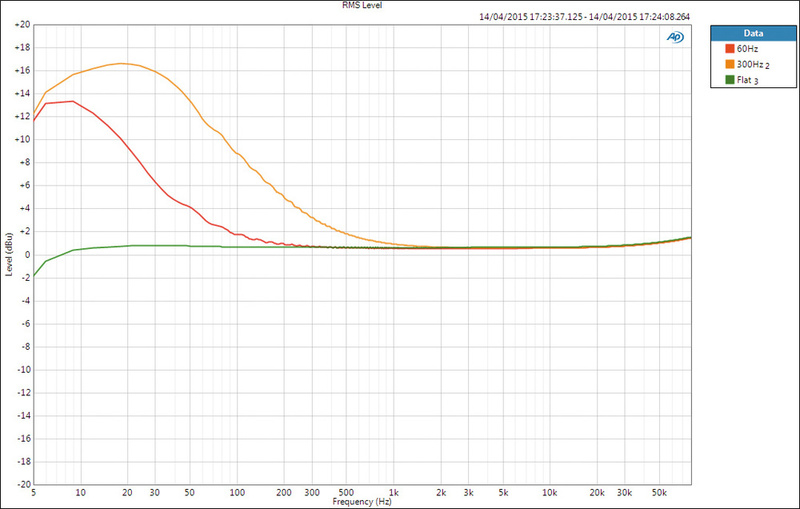 The decreasing sensitivity to low frequencies is shown here for the 60Hz (red) and 300Hz (orange) side-chain options. The fastest attack time is easily capable of generating significant transient distortion if you’re not careful, but it is also extremely powerful for transient shaping, really clamping down on the front edge of a percussive signal, or allowing it to punch through. The inclusion of a mix control works well in this context, allows the source signal to be blended with the processed to restore transients while still benefiting from the powerful up-lift compression. The fastest release time is far quicker than any other hardware compressor I know of, which brings some interesting sound-shaping possibilities into play, and makes bouncy pumping effects easy to achieve. I’ve often found the dual-slope auto-release concept to work well, and it is very well judged in the Tweaker. With percussive sources, it can be used to bring out the body and resonance of drums nicely without creating unwanted pumping, and it is fabulous for delivering a responsive but transparent dynamic control without killing the energy. Treble Smash: the Treble Smash mode increases the compressor’s sensitivity to upper-mid frequencies centring on 8kHz, while simultaneously decreasing its interest in the lower-mid and LF. The response is broadly similar to that of the fully clockwise Edge-Contour mode, but with a stronger bell HF response instead of a shelf. However, the real powerhouse of the Tweaker undoubtedly comes in the form of its side-chain filtering options and, in particular, the Treble-Smash and Edge Contour modes. I found that I tended to use the edge-contouring option most, shifting the control left or right of centre to focus the compression towards reigning-in the highs or lows, as desired. It’s a remarkably powerful but easy-to-use tool, and the Treble-Smash option is even more powerful for taming a strident high end in a very ‘analogue’ kind of way. In fact, to achieve great-sounding results it’s not even necessary to apply any gain reduction — the Tweaker can be used to introduce nice, musical-sounding, distortion to fatten things up, ranging from subtle saturation right up to a heavy full-on punk grime. I can’t think of any other compressor that can be directed to react to (or ignore) specific spectral portions of the source material in such a powerful way, and with some careful adjustment and fine-tuning of the controls the Tweaker really can be persuaded to provide everything from clean, transparent and very gentle dynamic taming, right through to gritty, grungy, hard and percussive sound design. The Tweaker is a dynamics processor rather than a simple ‘compressor’ and I’m encouraged that new devices are being introduced to the audio industry with such creative innovation and potential. In fact, scratching around for negatives, as a reviewer must, the only one I can offer is that Kush don’t currently offer a fully integrated stereo version — I really hope they have plans to do so, because while a pair of Tweakers would already form a fabulous mix processor, that would be even better! There are countless compressors on the market, including many with side-chain filtering and wet/dry mix controls, and a few with user-configurable saturation processing. Yet, I’ve never come across a device which has built in anything like the extreme versatility and flexibility of the Tweaker. This really is a unique and wonderful product. Offers an enormously broad sound palette. Side-chain-shaping facilities are immensely powerful. Drive allows controllable distortion that doesn’t kill the transients. Mix control for parallel processing effects. Unusually broad attack and release time ranges. There’s a learning curve to climb in mastering its use. An inspired and innovative single-channel compressor that offers many interesting and creative sound-shaping possibilities.